Groups or Pages Database Design. Last few days I have been working with an important release from 9lessons.info, I am introducing many exciting features hope everybody will love. This post is about how to implement Group of Fan Page system using MySQL and PHP. 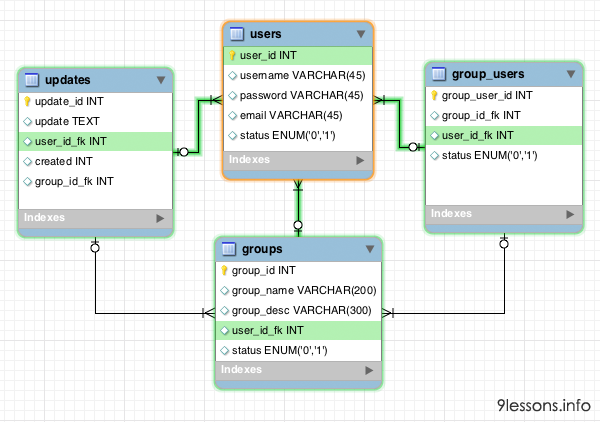 Here I have discussed how to design a database and implementation of SQL queries, hope this post will help you to understand the Group/Page system. To build the group updates system, you have to create three tables such as Users, Updates, Groups and Group_Users. This statement is required for group/page registration, here user_id_fk is group/page owner. 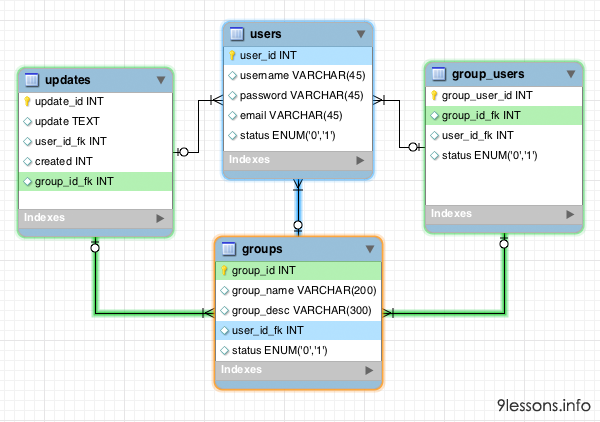 Data relations between users and group_users tables for displaying group memebers. Take a look at the following SQL statement users table object as U and group_users table object as F. Here user_id is the login user session value and $group_id is group row number. Data relations between users,updates and group_users tables for displaying following group updates . Take a look at the following SQL statement users table object as U, updates tables object as M and friends table object as F . Here user_id is the login user session value. Hi 9lessons team, I follow and read your articles in regular basis,can you please write a simple tutorial on object relation mapping in php,for example doctrine orm .Thank you. YOu have the diagrams so you can build your doctrine schema based on the diagram design. Great Post. I am looking for user access level tutorial. Thanks for this page presenting database "good" ideas. PLEASE explain, justify and/or describe! A scheme and code isn't teaching ! Srinivas, I'm not sure or not clear what "Groups or Pages" is, where will I use this or it's purpose. Could you clarify please? This is a nice post. Thanks for it. Here I have specified SQL queries, just display the data with your favorite language.